Every person has 2 set of teeth in their life. The baby set consists of about 20 teeth and baby teething begin by the age of three years old. These teeth remain there until the child turns 6 years old or so. The second set of teeth is permanent, consisting of 32 teeth, of which 4 are the wisdom teeth. These permanent teeth usually start growing into the mouth between the ages of 6 and 12. Permanent teeth are much bigger than baby teeth, and they take longer to grow into the mouth since these are permanent and are anchored better in the mouth. Though most babies do not show their first tooth until around the age of 6 months, the teeth have been growing and forming long before birth while they are in the womb during the second trimester. 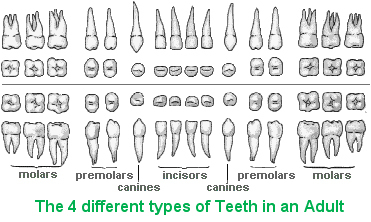 Since most adults have 32 teeths, then how many types of teeth do they have? There are eight incisors. These are the four bottom and four top teeth seen when a person smiles. These teeth only have a single root, and are often flat shaped and wider, which helps the tooth to get more strength for eating. These are the pointy teeth on the top and bottom and each person has four of these. Some canines are pointier than others. This is one of the teeth characteristics that are shared with several animals in the world. They are the sturdiest teeth in the entire mouth, and help to ensure that all teeth are sturdy when they are in place. There are eight premolars that are located next to the canines, on the side of the mouth. Premolars are really a combination of incisors and canines since they can not only tear foods, but are also thicker for chewing. There are a total of 12 molars, all labeled based on when they develop in the mouth. For example, there are six year molars, 12 year molars and wisdom teeth. On the top of the mouth, these teeth have three roots, while the bottom molars only have two roots. The six year and 12 year molars often cause no problems for kids when breaking through the gums. The wisdom teeth are often removed when a child is in teenager as they may cause problems. When a wisdom tooth only partially comes into the mouth, they are most often removed, as the partial tooth can increase the risks of infection. 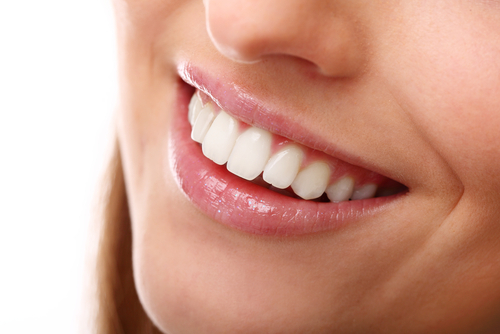 Enamel is what protects a tooth, and is the hard outer layer of the tooth. The enamel consists of phosphorous and calcium. It is imperative to keep the enamel healthy as this is the only way to ensure the health of the entire tooth. 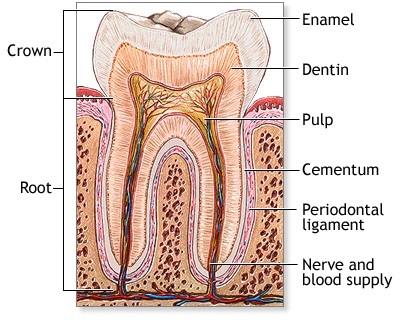 The enamel is the white portion of the tooth. It is important to note that some drinks and foods stain it, while many chemicals out there that are meant to remove these stains can actually damage the enamel. This is the layer underneath the Enamel that looks like a bone. However, it is not as strong as bone, thus it can decay if the enamel were to wear away. This is what anchors the root of a tooth to the bone. This cannot be seen by looking at the teeth. It is yellow in color and is only seen when the gums start to erode. The best way to protect the cementum is through proper gum care. This is at the center of the tooth and where the blood and nerve signals are held. This is the information center, so to speak, allowing you to feel cold or hot on your teeth, as well as pain. The enamel and dentin are what works to protect the pulp from damage. You should brush your teeth two times a day, for at least two minutes each of these times. While brushing, be sure that you get to the front and the back of the teeth, as well as the tongue, as germs can lurk in any of these areas. Brushing alone does not get in between the teeth, which is where floss comes in. It is best done at night to remove any food that may be in between your teeth, which could cause bad breath as well as several other gum issues. Rinse and spit with mouth wash after brushing and flossing teeth at night, as this not only works to help strengthen the tooth enamel but also kill germs that may still be present in the mouth. There are several types on the market, so find the one that suits your needs. It is recommended to go visit your dentist at least once every six months for a checkup, and in between if you have issues with your teeth. Preventative care with a dentist can help to avoid serious mouth and teeth issues later.